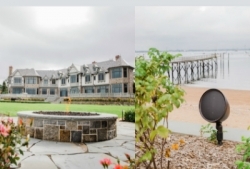 NYC integrator ATTYWON designs outdoor audio system for massive Long Island property using 27 120-degree dispersion Episode speakers with no subwoofers. Did it work? I like the idea of lots of 8” woofers (27) instead of a few subwoofers as the bass although probably not as deep is spread more evenly. We just tried six of the 6” version of the Episode. They were located around a pool/spa area and I really like the results. We will use them again! I have no doubt this worked well. We are big fans of the Episode LS speaker products with the Crown Amps. The house is beautiful and appears to be on the LI Sound, though not on the Atlantic Ocean which would be miles to the south. So lots of boats and other water traffic but no “waves off the Atlantic constantly breaking against the beach”.